A few weeks ago when iPhone firmware 2.1 was released I quickly updated and VOILA! The laggy keyboard and sluggish interface from 2.0.2 had been solved. Less than a week later my iPhone was jailbroken using QuickPwn 2.1. Gaining access to customization and 3rd party apps is all the rage and glory at the moment. There are lots of 3rd party applications that are available in Cydia and Installer when you jailbreak. Some are pretty cool whereas some are just plain useless. Remember my list of the Top 5 App Store Apps? Well it’s time to create a new Top 5! Let’s go over my favorite Top 5 Jailbreak Apps! 1. PDAnet – With PDAnet, you can now tether your iPhone data plan and turn your iPhone 3G into a wireless router! PDAnet puts NetShare and iPhoneModem to shame because it’s incredibly easy to setup, plus you will have access to FULL internet. It’s a must have app for people who will jailbreak their iPhones. 2. 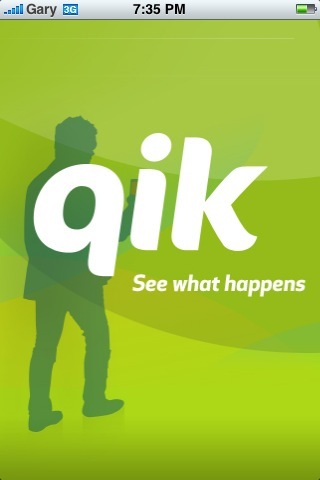 QIK – QIK is the ultimate video recording solution on your iPhone 3G. With QIK you can record and stream LIVE video to your QIK.com portal for the entire world to see. It’s a fantastic app for when you come across something that should be recorded and live streamed to the internetz. For example, when you find out that tethering your data plan resulted in a $100,000 bill, and you want the world to witness your rage, QIK might be the outlet you’ve been waiting for. 3. QuickGold – I haven’t reviewed this yet but it’s quite possibly the most useful application I’ve used to date. 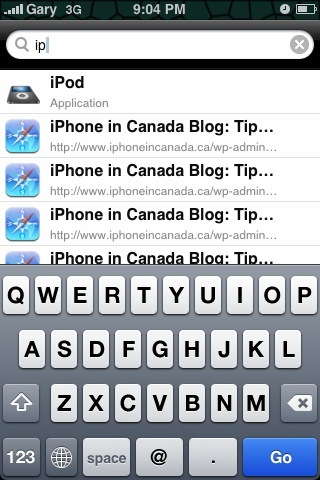 QuickGold brings search to your iPhone, similar to the application QuickSilver on the Mac. With one click of the home button, you can search contacts, SMS messages, bookmarks, apps, and anything else you can get your hands on. Just touch the results and QuickGold will launch the respective application. 4. 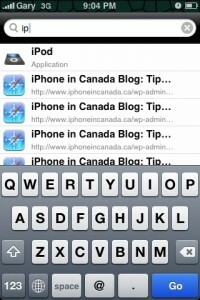 BossPrefs – This is a must have app for those with jailbroken iPhones. 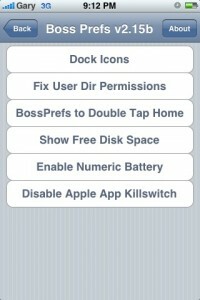 BossPrefs gives you the ability to control preferences on your iPhone that Apple left out. 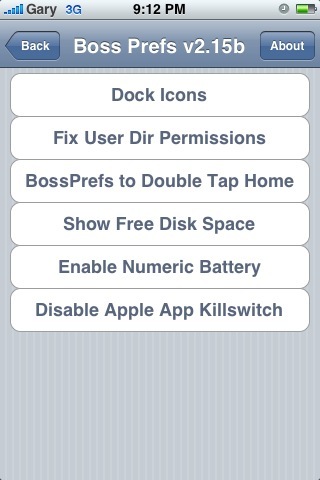 There’s also a option to create a shortcut to launch BossPrefs by double tapping the home button. Once there, you can instantly shut off WiFi, 3G, EDGE, Bluetooth, you name it, it’s there. Also you can hide some of the default icons (EG Weather, Stocks, Clock, etc) to clean up your Springboard. Definitely a cool app and a must have. 5. Winterboard – Last but not least, let’s not forget everybody’s favorite this fall, Winterboard. The successor to Summerboard (what’s next, Fallboard or Springboard? ), this application will enable you to change iPhone themes and individual icons, to customize your iPhone. I love being able to change the theme on my iPhone. I think it keeps the iPhone looking fresh, plus it will make your homescreen stand out from the gazillion other iPhone 3G’s out there. When I first updated to 2.1 my iPhone 3G was superfast. Now, after the 2.1 jailbreak with QuickPwn the speed was still there. However, just recently I’ve been experiencing some MAJOR lag. Launching SMS, Phone, and even settings has resulted in wait times of up to 10+ seconds! Could this be a result of the jailbreak, or the ever growing number of applications I keep downloading from the App Store? Are you experiencing any slowdowns? I am considering restoring to 2.1, restoring from back up and then reinstalling my 3rd party applications. Anyone else experiencing slowdowns? Now that I’ve shared my list, let’s hear your Top 5 Cydia/Installer apps!